I am an ex Durbanite & I have been trying to find a particular fruit name. The fruit used to be called “Dutch Apple” – purple /sweet sour with a big hard woody seed. I was advised to try Crab Apple but it did not resemble a Crab Apple. Albert Park in Durban had many of these fruit trees. An Otaheite Apple perhaps https://www.tntisland.com/images/otaheiteapple.jpg … or maybe a Star Apple https://www.hort.purdue.edu/newcrop/morton/images/Plate58.jpg … or are those too exotic? HiIris, I found some of these in a road near Ridge Road in Durban, and went interetting. It’s correct name is Pleiogynium cerasiferum, and I think they are called burdekin plums, maybe from Australia. Anyway, I picked some that had dropped off the tree, and am trying to grow them now. Perhaps you are refering to a custard apple. Delicious! try and buy a custrd apple from a supermarket and grow your own from seed – it works. I have also grown Jack fruit this way. 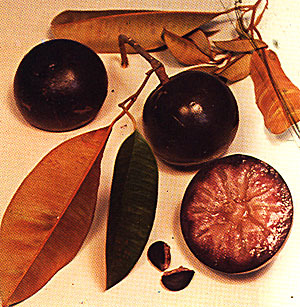 Mdonis are called Jamun fruit . Burdekin Plums are Dutch Apples. Hi. Anyone knows of cherimoya trees for sale. I have started the trees from seed but i have read that it takes 4 years to fruit. Sjoe!